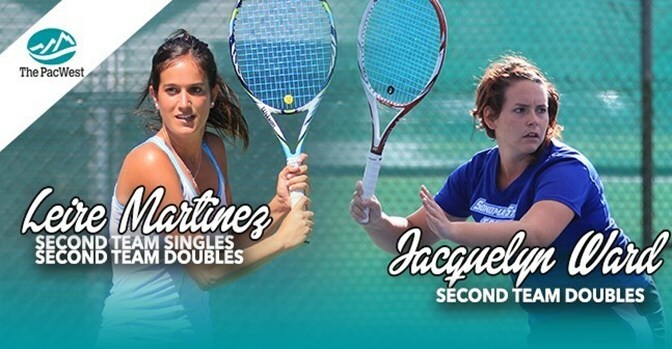 Sonoma State Seawolves Leire Martinez and Jacquelyn Ward have been selected to the 2015 All-Pacific West Conference Women's Tennis Team. Martinez was a second team pick in singles play while she and Ward earned second team accolades as partners in doubles play. Philip Holbrook and Noah Lee are on the 2015 All-PacWest Conference Men's Tennis Team in both singles and doubles. Holbrook was selected to the second team in singles with Lee receiving third team honors. The duo was honored together as third team in doubles. For the seventh straight year the Sonoma State softball team is headed to the big dance. The Seawolves (39-19), who finished third in last weekend's CCAA tournament in Stockton, have qualified for the 2015 NCAA Division II Softball Championship Tournament as the No. 5 seed and will open up the West 1 Regional on Friday against No. 4 seed Humboldt State (41-17) in Seaside. The Sonoma State baseball team closed out its 2015 season with a wild affair that saw the Seawolves connect for four home runs and build a lead, only to see Cal State Monterey Bay rally before handing the Seawolves a 7-8 walkoff loss. The Seawolves finish the season 17-23 in the CCAA and 23-27 overall. Tori Dwyer ran her third-best time of the season in the 3000-meter steeplechase, crossing the line in 12:11.91 for a 15th place finish out of 18 competitors on Saturday at the CCAA Track and Field Championships at Cox Stadium in San Francisco. The event closes the first season for the Sonoma State women's track and field team since the program was discontinued after the 2007 campaign.